Wellington mayoral candidate, Jo Coughlan, standing in front of one of her election billboards. Right-wing mayoral candidate, and current Wellington City Councillor, Jo Coughlan, has ducked answering questions relating to her campaign policy advocating for a four-lane motorway from Transmission Gully to Wellington airport. Coughlan has been a city councillor since 2007, as well as Director for PR firm, Silvereye Communications. Amongst her PR company’s clients are the Ministry for Education, Energy Efficiency Conservation Authority (EECA), Department of Building and Housing, NZ Post, and ACC. As well as a Director to Silvereye Communications, Coughlan is (was?) a Director of Life Flight Trust – which also happens to be a client of the same PR company. From 1996 to 1999, she was Press Secretary for then-Foreign Affairs Minister, Don McKinnon. Coughlan is also wife to Conor English, brother to current Finance Minister, Bill English. Coughlan linked expanding the roading network with electric cars, even though currently there are only about 150 of the vehicles in the region. There is no other mention of public transport, except in relation to “fixing our roads“, in any of Coughlan’s other election material (seen by this blogger). Her website also makes only a brief reference to “public transport options”. On 25 July, this blogger contacted Coughlan through Facebook, asking if she would be available to answer questions on her policy. The four laning can be achieved by four laning Ruahine St as planned by NZTA. Q1: In your pamphlet, “My Road Map for Wellington’s future”, you linked building of more roads to public transport stating, “Fix our roads to make public transport more reliable”? What did you mean by “fix our roads”? How does that relate to public transport? There are 43,000 more cars on Auckland’s roads than this time last year, with nearly 11,000 of those vehicles registered in January alone. It’s no wonder the city’s traffic congestion has worsened over that time, national roading authority New Zealand Transport Agency (NZTA) says. An average 168,500 vehicles now cross the Harbour Bridge every day, compared with 17,000 in 1960 shortly after it opened. “You’re reaching a point where you can’t add any more traffic to the Harbour Bridge,” Pant said. It is unclear how more roads would “make public transport more reliable“. Ms Coughlan might have shed some light on this unanswered question. Q2: In pamphlet, you stated, “We need roads that keep us moving. Electric cars need roads”? What do you say to those who say it is disingenuous to link environmentally-clean electric cars with the building of more roads? With only 150 electric vehicles in Wellington, there seemed no apparent need to build more roads at a cost of billions, for such a small, insignificant number of alternative-fuel cars. The possibility exists that Ms Coughlan was being willfully disingenuous, and attempting to “green wash” an environmentally unfriendly policy.Was that Coughlan’s intention? Q3: Along with your advocating for a four-lane motorway from Transmission Gully to the airport, you’ve stated you want to “work with Government to accelerate building of the city’s infrastructure and roading to keep the city moving”. Bearing in mind that the planet’s temperature continues to rise according to latest data from NASA and the US National Oceanic and Atmospheric Administration (NOAA), and also bearing in mind that fossil fuels like oil and petrol are prime producers of greenhouse gases, isn’t a four-lane motorway of the kind you are suggesting irresponsible? However, nowhere in her election material does Coughlan refer to the effects of climate change on our natural environment. Q4: Are you aware of NASA’s latest findings that ” the six-month period from January to June was also the planet’s warmest half-year on record, with an average temperature 1.°C warmer than the late nineteenth century”; that “Arctic sea ice at the peak of the summer melt season now typically covers 40% less area than it did in the late 1970s and early 1980s” and that “Arctic sea ice extent in September, the seasonal low point in the annual cycle, has been declining at a rate of 13.4% per decade”? Q5: Are you aware that the NOAA recently confirmed NASA’s data, stating, “The average global temperature across land surfaces was 2.33°C above the 20th century average of 3.2°C, the highest March temperature on record, surpassing the previous March record set in 2008 by 0.43°C and surpassing the all-time single-month record set last month by 0.02°C”? More specifically, the NOAA reported that “New Zealand reported its sixth warmest March in a period of record that dates to 1909, at 1.3°C above the 1981–2010 average. The entire country had above or well-above average temperatures for the month. Parts of Northland, Waikato, Manawatu-Whanganui, and Westland were each more than 2.0°C above their March average”. What is your comment on those latest findings? The first six months of 2016 were the hottest ever recorded, NASA announced on Tuesday, while Arctic sea ice now covers 40% less of the Earth than it did just 30 years ago. Temperatures were on average 1.3 degrees Celsius (2.4 degrees Fahrenheit) higher than average between January and June this year, compared to the late nineteenth century. In total, the planet has now had 14 consecutive months of the hottest temperatures seen since records began in 1880, the U.S. National Oceanic and Atmospheric Administration (NOAA) said. Australia, the United Kingdom, Hong Kong and Spain were some examples of places where temperatures soared more than a degree above average, as New Zealand had its hottest January to June period since records began. Was Coughlan aware of this latest information? She should be: it has been well document in recent local media. Ms Coughlan might have shed some light on these unanswered questions. “Changes expected to impact New Zealand include at least 30cm and possibly more than one metre of sea-level rise this century – the report finds it likely that the sea level rise around New Zealand will exceed the global average, which will cause coastal erosion and flooding, especially when combined with storm surges. Q7: Instead of building more roads that inevitably lead to more traffic; more congestion; more fuel-consumption; and production of more greenhouse gases, wouldn’t advocating for more expenditure on public transport make better sense, from an environmental aspect? Q8: Aside from your one statement linking “Fix our roads to make public transport more reliable” your election material makes no mention or reference to public transport. Why is that? One has to admire Coughlan’s confidence in being a mayor for the next one hundred years. Q9: Which is more pressing for Wellington’s needs for the next 100 years; taking action to reduce greenhouse gas emissions, or planning on more roading? Which would have greater priority fror you, if you were Mayor? Q10: President Obama has said that “And no challenge — no challenge — poses a greater threat to future generations than climate change”. What is the responsibility of individuals to address this threat to our future? Q11: What is your responsibility in this, Ms Coughlan? It could be said that Ms Coughlan, as one person, has minimal effect on our increasingly violent weather patterns and rising sea-levels, brought on by anthropogenic-induced global warming. Throughout history, single people have been the instigators of momentous change and upheaval. Not always for good. If Jo Coughlan were to become mayor – a distinct possibility based on the considerable amount of money spent on her election advertising – her plans to advocate for a four lane motorway would be instigating momentous change and consequential upheaval. “However it is amazing that some candidates are not prepared to state clearly their real intention for standing and don’t seem to understand the STV voting system used in the Capital. I am making it very clear that I am standing for the Mayoralty, not as a ward councillor and not to raise my profile for a tilt at parliament. I call on all other candidates to publicly state their real intentions. So far we have a number of candidates standing with various agendas including increasing their chances of re-election to Council, election to parliament and even to gain profile to look at establishing a new centre-left political party. Wellington voters deserve a Mayor who will lead the City and is 100% committed to running for the right reasons. No wonder Coughlan has avoided answering questions. This blogpost was first published on The Daily Blog on 31 July 2016. Hickey’s suggestion that “English increased the Government’s spending allowance in Budget 2016 for the 2016/17 year to NZ$1.6 billion from NZ$1.0 billion to accommodate extra spending on health and education because of population growth“ seems at variance with the Finance Minister’s own denial that his Budget was predicated in any way on a per-capita basis. To be fair on Hickey, he wrote his story prior to English’s comments, which were two days later. At least now we all know that English does not factor-in per-capita data in his Budgetary calculations. He was categorical in his assertion. English’s own words reveal that he wilfully misled Lisa Owen on 28 May, on ‘The Nation‘. Unfortunately, fact-checking politicians who spin untruths is not easy, and requires quick-thinking and an encyclopedic memory. Only in retrospect can we fact-check politicians’ statements and determine how honest they have been with the public. As always, eternal vigilance is the duty of all citizens. Letter to the editor – Did Bill English try to pull a swiftie on ‘The Nation’? Budget 2016 – Who wins; who loses; who pays? This blogpost was first published on The Daily Blog on 6 June 2016. “Very quietly, a cut here and a decrease there, a failure to keep up with inflation in one place, and ignoring increasing population in another place, the Government is walking away from New Zealand’s longstanding social compact. In his Budget speech, Bill English proudly says that government expenditure is down to less than 30 per cent of GDP, and that’s the way that it’s going to stay. But how is this retreat from the economy achieved? “Sadly, it seems once again that the Budget is a missed opportunity for children, while the military and Government spy agencies do extremely well. I don’t recall seeing any public opinion polls or evidence indicating the need for more investment in either of these areas, especially when there is such desperate need among families with children. There is absolutely zero doubt in my mind that the 2016 Budget is geared 100% toward building up a surplus for tax cuts to be announced next year. Just in time for the 2017 Election. John Key and Bill English have strongly indicated as much with their “kite-flying” with hints of cuts-to-come. Funding for various state services have either barely increased – or drastically cut. The result has been a $700 million surplus – which appears to have been achieved at the expense of cutting funding for social NGOs and state services for the most vulnerable people in our society. Funding for spy agencies (GCSB and SIS) will increase over the next four years by $178.7 million. Endangered species throughout New Zealand and future generations of New Zealanders. Budget: frozen – nil increase since 2008/09. School operational funding has been frozen in this year’s Budget in favour of targeted funding for [under-achieving, at-risk] 150,000 kids. … $43.2 million over four years will be provided to those schools with under-achieving students, and it’s expected the money will be used to raise achievement, there’s no accountability attached to the funding. “low-income tenants, particularly those with high health needs. 1 – This Surplus was achieved at the expense of the poor. With school operational funding frozen; no increase for early childhood education funding; a dire crisis of homelessness; State houses being sold of by National; and a critical shortage of housing – it does not take much wit to understand that Bill English’s $700 million Budget surplus was achieved by under-spending in key social areas. Worse still, National continues to doggedly pursue it’s policy to sell up to eight thousand state houses by 2017. Compounding National’s mis-management of the country’s scandalous housing crisis is National’s unrelenting and inhumane demand for dividends from Housing NZ. This far, National has extracted over half a billion dollars from Housing New Zealand by way of dividends. The above figures do not include taxes paid by Housing NZ to the National government. Imagine how many state house could have been built by Housing NZ in the last seven years. Imagine that every low-income family that needed a warm, dry, home – could have had one by now. Imagine that instead, National will be demanding another dividend this year from Housing NZ – and will be effectively giving it away by means of tax-cuts to affluent New Zealanders. 2 – Many so-call “increases” are illusory. School funding for 150,000 under-achieving, at-risk school children, was budgeted at $43.2 million This sounds good. But that figure is spread not over the 2016/17 period – but over four years. $18 million of operating funding over two years to extend the Warm Up New Zealand programme to insulate rental houses occupied by low-income tenants, particularly those with high health needs. $18 million over four years to expand the Healthy Homes Initiative to reduce preventable illnesses among young children (newborns to 5-year olds) who are living in cold, damp and unhealthy homes. This is how English created his Budget “surplus” – with cleverly concealed cuts to social programmes that impact on the poorest; most powerless; most desperate people in our society. And we wonder why entire families are living in garages, cars, and tents? And we wonder how it came to be that children are dying from mould in damp houses? As is almost always the case, those at the bottom of the socio-economic heap are the ones who pay for National’s ideologically-inspired budget. Sometimes they pay with their lives. Expect more of the same next year. It is refreshing to see indications that New Zealanders are still compassionate to children from vulnerable, less well-off families. There is still hope for our society, even if people like Key, English, Bennett, Tolley, et al have turned their heads to look the other way. Acknowledgement: Many thanks to Deborah L for her sharp eye, spotting, photographing, and sending me the above images along with relevant info. NZ Herald: Dr Deborah Russell – Budget 2016 – How do we look after all New Zealanders? The Daily Blog: The rules for the old too good for children? Tax cuts and jobs – how are they working out so far, my fellow New Zealanders? 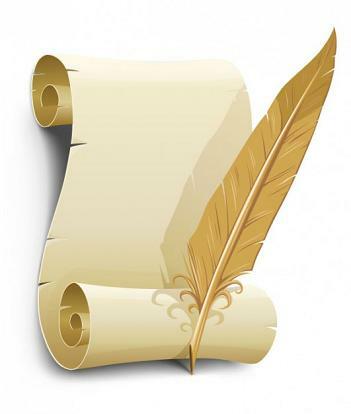 Letter to the Editor – tax cuts bribes? Are we smarter than that? This blogpost was first published on The Daily Blog on 2 June 2016. What?! The Finance Minister was saying to the New Zealand public that he “ couldn’t say for sure whether it’s [per capita spending] up or down“?! So how does he allocate money within the multi-billion dollar budget? By roll of a dice? It beggars belief that a Finance Minister, responsible for a budget of $77.4 billion of taxpayer’s money, appears not to know if per capita spending on health and education is up or down. This would be akin to mum and dad doing the weekly grocery shopping – and not knowing how many children to buy food for. It simply is not credible that a Finance Minister would be unaware of such basic information. So which is it – incompetence or evasion? This blogpost was first published on The Daily Blog on 29 May 2016. State Houses – “Wrong place/wrong size”? Hundreds of state houses in Tauranga and Invercargill could be sold to independent providers in the first phase of the Government’s plans. In January Prime Minister John Key announced that state house reforms would see up to 2000 state homes sold to “community housing providers” this year, as it cuts the number of state houses it owns by 8000 over three years. Although the Government was marketing the process as “transfer” the houses would be sold to community groups, generally charity based providers. Because the houses would have to be kept as social housing rather than private sales, the houses were expected to be sold at a discount to the market value. After nationwide consultation, Housing New Zealand Minister Bill English and Social Housing Minister Paula Bennett said that the first sales were likely to take place in Invercargill and Tauranga. Various ministers, including our esteemed Dear Leader, have indicated that up to “a third” of state houses are “in the wrong place or wrong size (or ‘type’)”. The “wrong size/wrong place” claim is the argument used by National to advance a major sell-off of Housing NZ properties. “Yes. As recently as just last month Housing New Zealand issued a press release that said: ‘around one third of our housing stock is in the wrong place, wrong configuration or is mismatched with future demand’. Housing NZ currently “manages 67,245 homes” (as at 30 June 2015). 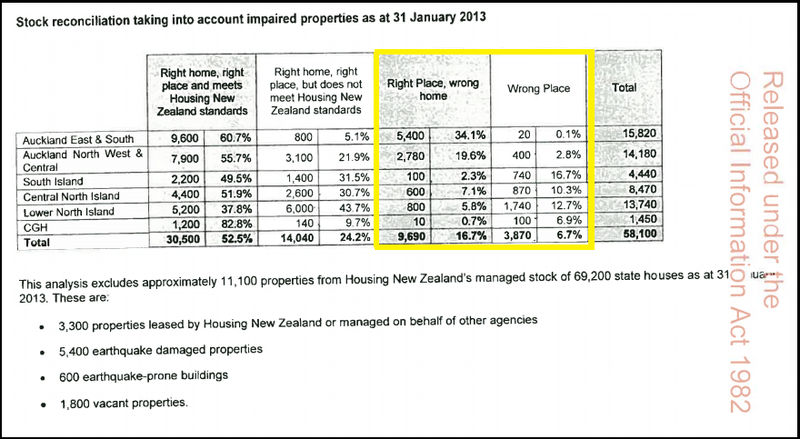 When Key, and other National ministers refer to “around a third of Housing NZ properties”, simple arithmetic translates that fraction into 22,190 homes being the “wrong size/wrong place” . In two columns headed “Right Place, wrong home” and “Wrong Place“, the respective figures add up to 13,560. This constitutes a little over half of the “22,000” that is being bandied about by National. Like much of National’s “facts”, the numbers did not stack up. Because if it’s in the “wrong place” when owned by Housing NZ – why would it suddenly be in the “right place” owned by someone else? English’s response seemed to cast a distinction between State housing “in the wrong place/size” and properties to be sold/transferred to community organisations. Yet, his statement above would appear to contradict a statement issued by English and Bennett earlier on 6 May last year, which is explained further below under the heading, “The Great Invercargill and Tauranga Sell-Off”. See: State houses – “wrong place, wrong size”? 4. Where are they situated that are considered the “wrong place”? 5. How many areas have been designated “wrong places”? In none of the Minister’s correspondence was he able to provide specifics as to where State houses were in the “wrong place”. The ‘best’ he could do was list five regions; Auckland East & South; Auckland North West & Central; South Island, Central North Island, and Lower North Island. Surprisingly, Auckland was deemed to have 8,180 houses that are supposedly “Right Place, wrong home” and a further 420 that are in the “Wrong Place” – 8,600 in total. one- or two-bedroom homes or for much bigger homes. English did, however, point out that “these will generally be in provincial areas away from the main centres“. Even that has proven to be a mis-leading assertion from the Minister. Tauranga is certainly a “main centre” by most definitions, and the choice of that city would prove to be embarrassing to National, as the next chapter below showed. “This is another important step to creating a more effective and efficient social housing sector with more housing providers supporting tenants and their needs.” – Housing New Zealand Minister Bill English. As announced by the Prime Minister in January, the Government’s Social Housing Reform Programme includes plans to transfer 1000 – 2000 HNZC houses to registered CHPs over the next year. Ensure social housing is the right design and size and is in the right places for people who need it. English and Bennett continued to exploit the “wrong size/wrong place” spin that National was using to disguise the privatisation of State housing. Obviously the Ministers find it difficult to keep their “story” straight. Four potential buyers have made the final shortlist to buy over 1400 state houses being sold in Tauranga and Invercargill. In Tauranga, Accessible Properties, Hapori Connect Tauranga, and Kaiana Community Housing Partners made the shortlist to take over 1124 properties or tenancies. However, even as National’s English and Bennett were prepping State houses for sale, the country’s housing crisis began to be reported elsewhere throughout New Zealand. People resorting to living in camping sites and caravan parks? Is that what this country has come to after thirty years of neo-liberal “reforms”? To become a South Pacific version of America’s trailer-park “communities”? If, by shuffling ownership of State houses from Housing NZ to “community groups”, National believes it will solve our housing crisis and growing homelessness – they are far more out of touch than I ever thought possible. This is not just a stubborn pursuit of a free market dogma that has failed to meet basic social needs – this is pseudo-religious self-delusional behaviour from our elected representatives. English, Key, Bennett, Smith, et al, appear to be paralysed into inaction, like possums caught in the headlights of an approaching truck. I have said it before and will repeat my conclusions that National is incapable of resolving this crisis. Considerable State intervention is required, and that is anathema to a political party whose very DNA is based on the free market; reducing State involvement in commercial and social activities; and promoting private good over community benefit. It will take a collective anger from New Zealanders to take notice of what is happening in their own society. At the moment, so many New Zealanders seem insulated from the growing social problems that are worsening with each passing day. As Shamubeel Eaqub said on Radio NZ’s Checkpoint, on 26 May, there is an absence of empathy amongst many New Zealanders – a moral-disconnect with the poor; the homeless; those who have been left behind after thirty years of failed neo-liberal theory. “The only thing that’s missing now is aspiration and leadership,” he said. Perhaps our economist friend has nailed the problem perfectly; 21st century New Zealand is not just suffering from economic poverty. There is a poverty much, much worse. And that affects us all, regardless of wealth and income. State houses – “wrong place, wrong size”? This blogpost was first published on The Daily Blog on 27 May 2016. There are plenty of past instances of this kind of strategy. And he said the Labour Party forced his Government’s hand over announcing a new ban on synthetic drugs, which will take effect on 8 May. The Government’s new ban was announced late on Sunday after the Labour Party said it would announce on Monday its own plan to immediately stop the sale of synthetic cannabis and other psychoactive substances. He said the Labour Party has not affected the Government’s policies on synthetic drugs but forced its hand in terms of the announcement. “Tax havens are where there is non-disclosure of information – New Zealand has full disclosure of information, and so all you’ve got is New Zealand’s taken a different view from a lot of different jurisdictions and that’s because the way we tax is we tax a settlor. As mounting evidence from several sources disproved Key’s weak assertions, he was forced to announce an enquiry into the country’s trust laws. Then Labour Leader, Andrew Little, challenged Key to disclose his tax-returns – which Key refused point blank. Prior to the 2007/08 GFC, unemployment stood at around 3.4% – or 78,000 workers. As the GFC/Recession impacted on our economy, unemployment reached 7.3% by 2013 – throwing 154,000 people out of work. Seventysix thousand people lost their jobs as a result of dubious activities in the financial markets. Or did those 76,000 suddenly decide to voluntarily give up their jobs to go on the dole for $200 a week? Though the official unemployment rate is currently at 5.3% – there still remains 133,000 out of work. So not only was English blaming 133,000 workers for being out of work as the global economy was slowly recovering from the Global Financial Crisis – but is evidently blaming workers for the steady rise of unemployment since the implementation of neo-liberal economics in this country. Free trade agreements have also played a role in the destruction of jobs in New Zealand. As more and more manufacturing and service jobs were relocated to low-wage societies (China, Vietnam, Pakistan, Fiji, India, etc), the numbers thrown out of work increased in our own country. Cheap clothes and shoes from low wage societies are not cheap. They were paid for with the jobs of our fellow New Zealanders. Mr English apparently no longer believes “we owe them every effort to create the opportunity for a new job” and has shifted the “burden of recession” firmly back onto the shoulders of the unemployed. Or perhaps it is high time that people started asking the acolytes of the Church of Neo-liberalism – at what point do they understand and accept that blaming the victims of their failed, inflexible, free-market doctrine will not make that ideology work? How long do we have to wait, Mr English? Number 4 deflection can be used in conjunction with Number 1 deflection. Or even Deflection #2, for maximum reactionary responses from the ill-informed. Fairfax media: NZ PM John Key refuses to release tax records – what do we know of his assets? Benefit fraud? Is Chester Borrows being totally upfront with us?! This blogpost was first published on The Daily Blog on 17 April 2016.